Following the successful design and installation of two luxury bathrooms with The Brighton Bathroom Company, Sue & Peter returned to the Brighton Kitchen Company to completely redesign their utility space. Sue explained that, when working from home, her clients would often walk through the utility space and she wanted this to be a pleasant transition between kitchen and garden. 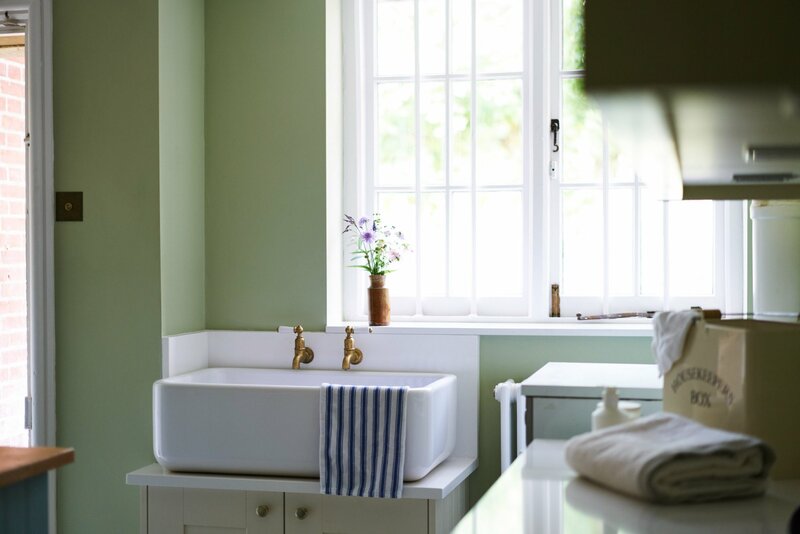 A well-presented utility room was required, in a style that was in-keeping with a rural, period property, retaining features where possible, such as the antique service bell board. The colour scheme had to be sympathetic to the existing kitchen space with a similar palette flowing through from one room to the next. The utility room needed to incorporate a number of appliances and the best use of storage possible, without making the space feel too overcrowded. A separate workstation was also required for occasional use. 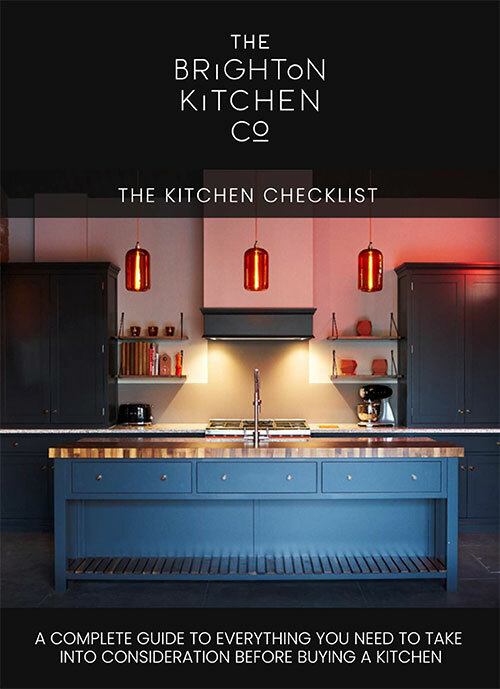 The room required substantial work prior to the kitchen install, which was undertaken by The Brighton Kitchen Company’s carefully-chosen team of experienced tradespeople. 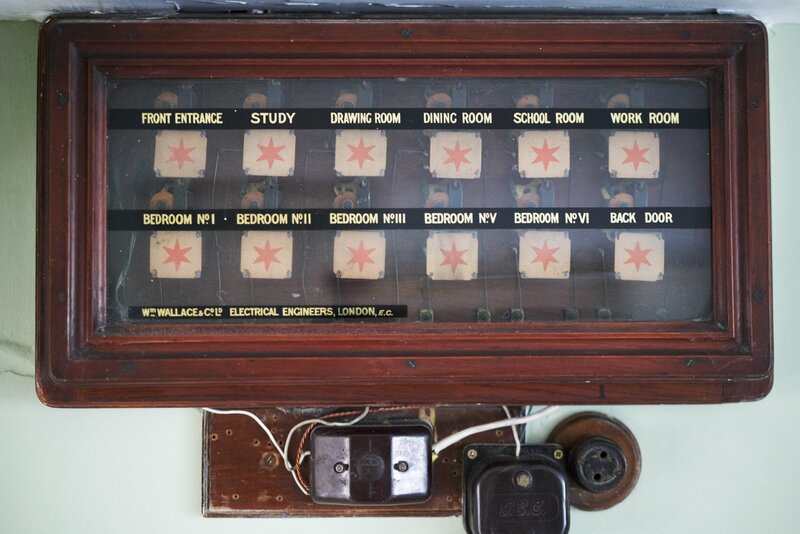 A substantial amount of pipework had to be hidden from view, and other services such as the electric board was concealed behind a reduced-depth dresser. Dresser cabinets were chosen for the scheme to maximise the storage available. These are not as imposing as full-depth larders which would have encroached on the space too much. Solid timber Shaker doors and delicate brass knob & cup handles were chosen for the scheme to complement the country setting. The colour scheme includes a tonal variation of greens. 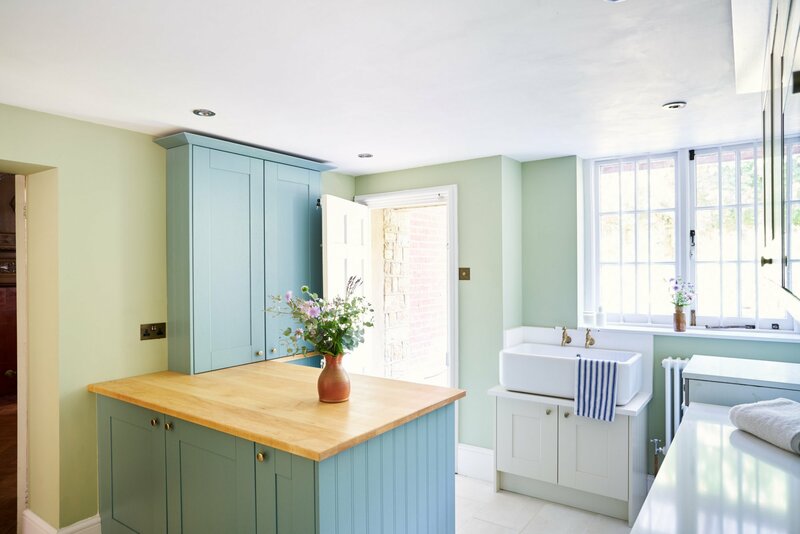 Cooking Apple Green paint by Farrow & Ball had been used in other areas of the property so we applied this to the walls of the utility room. 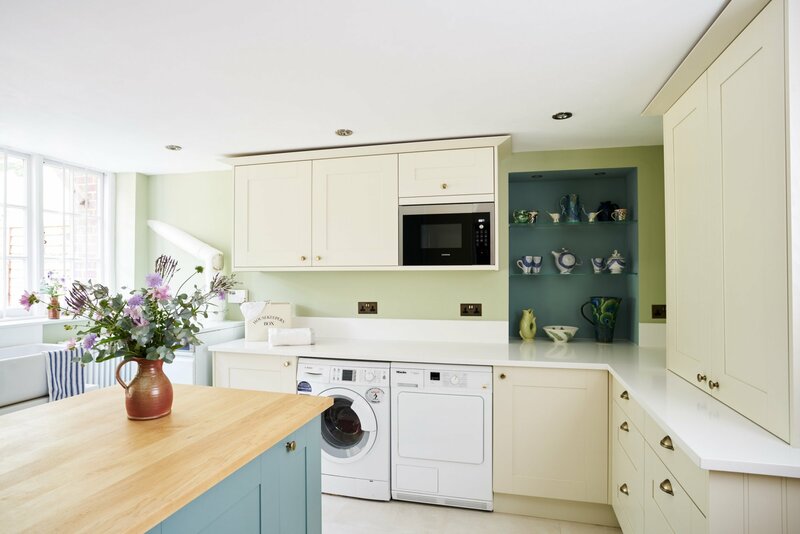 A teal green was then chosen for the peninsula cabinets with the feature alcove colour matched to suit. Lighting within the alcove was added and glass shelving to create an additional feature within the space. 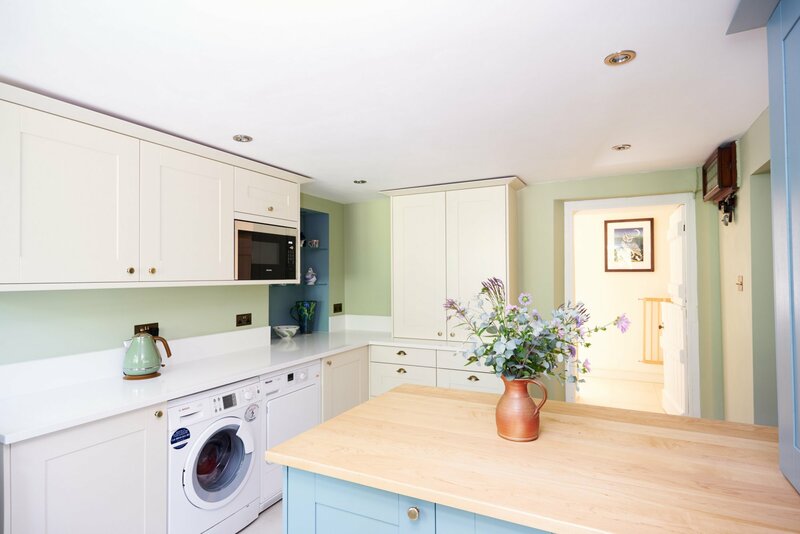 The lighter cream colour of the contrasting cabinet doors and white worktop softened the greens and added a warm, yet light and airy feel to the room. The peninsula also included a contrasting wood worktop in American maple, which adds further depth to the scheme. Wood is a great material to use for a workstation, breakfast bar or worktop overhang as it is much warmer to the touch than quartz or stone. Long-lasting, good quality appliances were chosen by brands such as Miele and Siemens, whilst incorporating the customer’s own washing machine within the scheme. A large butler sink is so practical in a utility room and even fits Sue & Peter’s little pooch for a good shampoo after a muddy walk in the fields!